As we posted last week, there is a new book on Neil Young that has been published recently titled THE MUSIC OF NEIL YOUNG by Chris Wade. And thanks to the good folks at Wisdom Twins Publishing, we have a copy to giveaway in a contest. Details below. 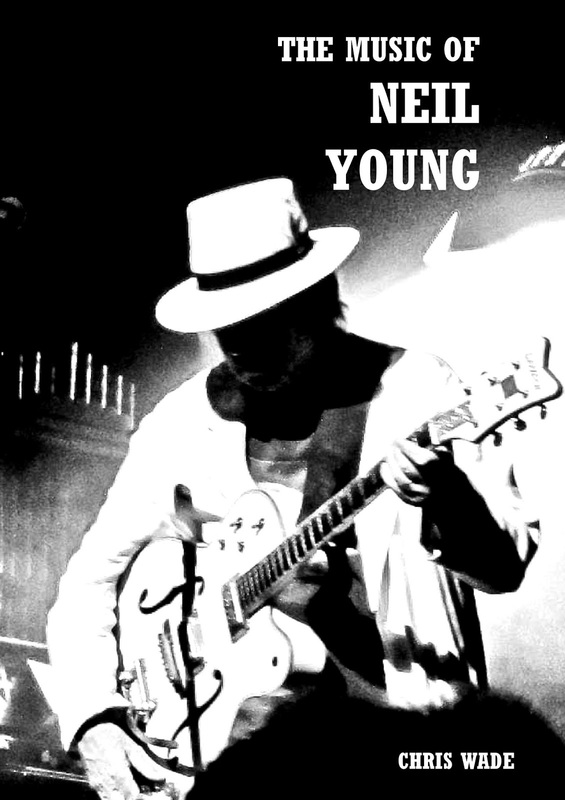 Here's a little interview we did with author Chris Wade on his new Neil Young book. Thrasher's Wheat: How long have you been a Neil Young fan? Chris Wade: I've always liked Neil Young, my dad would play Freedom and Harvest when I was a kid, as well as some Springfield stuff. But I got into him big time about 6 or 7 years back when I started getting the albums one by one. TW: What was your 1st Neil concert? Your 1st Neil album? CW: First concert was actually in June this year at Leeds, which I saw while I was writing the book. I put a review of it in the book too, as it was so amazing and powerful. It really was the best gig I have ever been to, so emotional and exciting. First album I bought by him for myself was the Greatest Hits, but my dad had already got me Harvest, Freedom and Gold Rush by then, and then I worked my way on. TW: How long did writing book take? CW:On and off a few months, but in June and early July I was intensely into it. Writing and recording is my job so I set aside a lot of time to really get into his work and study his career. TW: You're a musician? What instrument? Are you in a band? CW:My band is Dodson and Fogg, although it is more of a recording project really. I started it in 2012 and have had a lot of different folk on it as guests, like the British pop star Toyah, Scarlet Rivera who once played with Dylan and loads of others. I play as many instruments as I can, although guitar is my main instrument. TW: What did you find surprising about Neil to learn? CW:If I am honest, nothing surprises me about him. From the moment I started avidly following his work, I was excited by every new release he came up with, and most especially Earth, which has become my fave Neil album. I rushed into town when it came out and bought it, and couldn't wait to get it back to listen to it loud with the back patio doors open, to sort of let the nature outside blend its way into the album. So I am kind of surprised I guess by each new project, but in a way it's what we all expect of Neil, to do something new and exciting every time. TW: How did you find Neil's collaborators? Open? Cautious? CW:I found them open, at least the ones I was lucky to get through to. His sister Astrid in particular was very warm and I found her great at painting a portrait of Neil as an artist, and also I liked how she saw similarities between her and Neil. It was nice. I also loved how people like John Fumo and Niko Bolas had such great things to say about him, and told me how passionate he really is in life. CW:I have just released a new Dodson and Fogg album which has just come out and am currently working on a few more book projects, finishing off one about the British band Hawkwind. I love getting into new projects and am excited every time I take a new one on. I really enjoyed the Neil Young book too, it was a great experience an a great excuse to re-listen to all his albums again! For more on THE MUSIC OF NEIL YOUNG by Chris Wade. Also, paperback edition. A lucky Thrasher's Wheat supporters will be eligible to win a copy of The Music of Neil Young by Chris Wade. We truly appreciate being able to do what we do here at TW, and we love being able to give something back in return.